When it comes to fashion, it is probably obvious from my blog, that my favourite items are pretty dresses and mary-jane heels. I am truly obsessed with them and I simply cannot resist an item of this description, often spending way too much money. A beautiful dress or pair of heels can instantly make me feel happy. 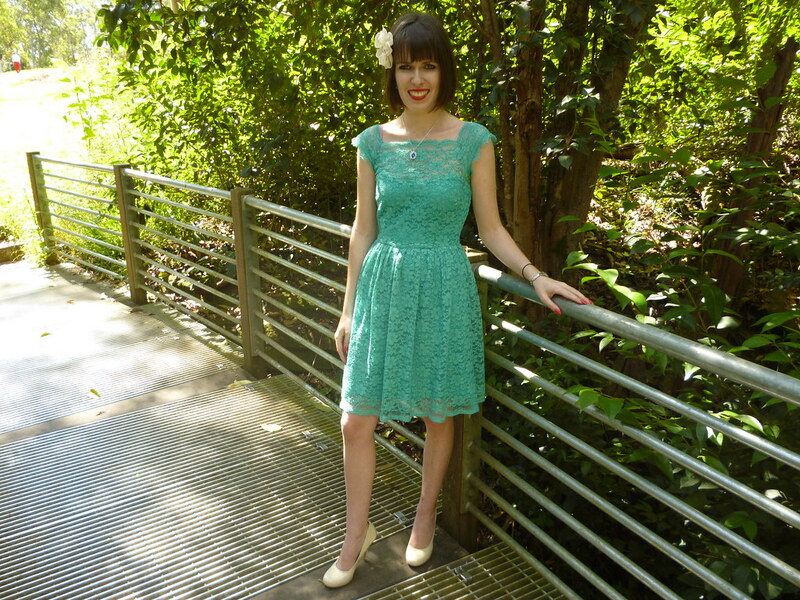 On Saturday I experienced this when I finally decided to buy this 1950s inspired mint lace dress from Portmans. I’ve had my eye on it for a few weeks now. It is probably the most expensive dress I’ve ever bought myself. I’m very impressed with the dresses in Portmans this season. The store has a number of unique vintage inspired pieces which I adore. The other one I have I displayed here. 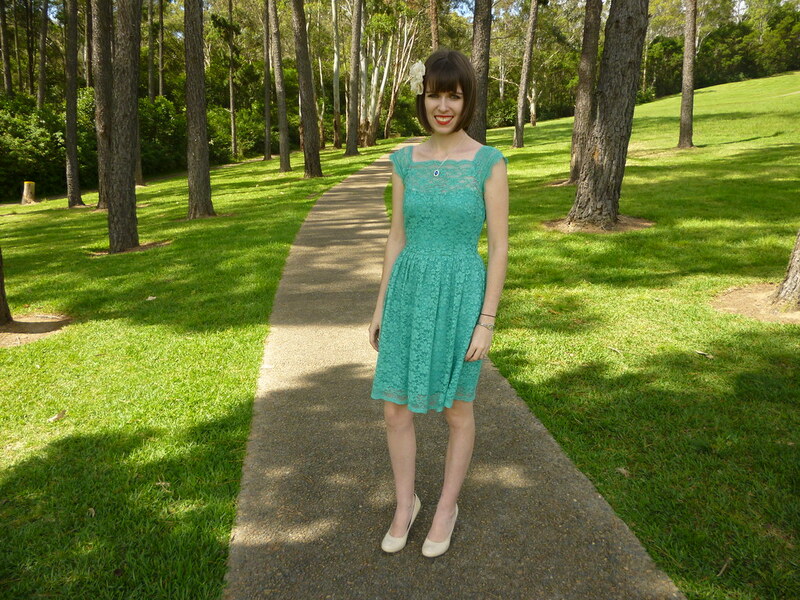 I wore my new mint lace dress to a baby shower on Sunday. I received many compliments on it. A few people even asked me if it was real vintage which, in my opinion, is the ultimate compliment. I think I may have a new favourite dress! This entry was posted in Outfits, Portmans, Wittner. Bookmark the permalink. Oh wow!!! This dress is so gorgeous! I may have to have a peek into Portmans tomorrow…. That mint lace dress is definitely perfect on U! beautiful lace dress! love the color! Such a pretty dress and I love that colour on you. I really really fell in love with your dress. It looks so special. 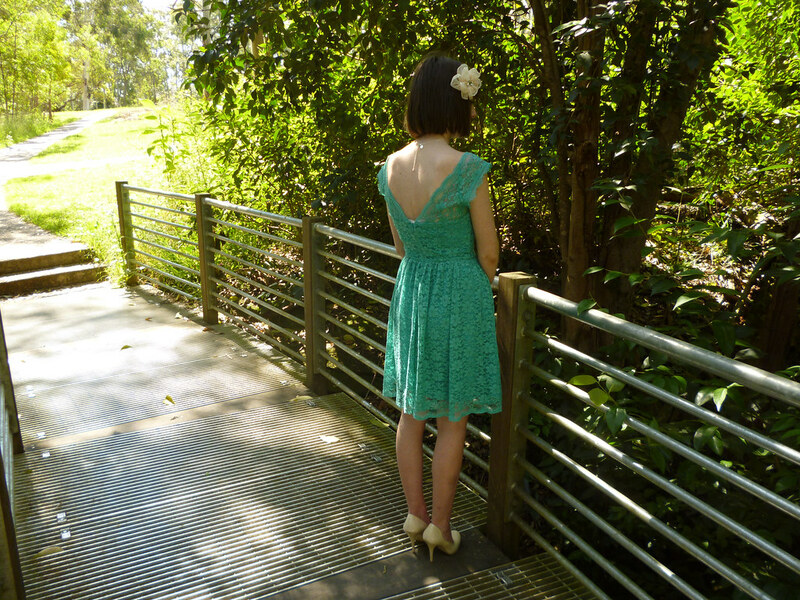 A lace dress in that amazing green colour is so hard to find. Great outfit!very romantic!I come from italy,Naples,come to see my blog! if you participate you can also win my GUCCI Giveaway! 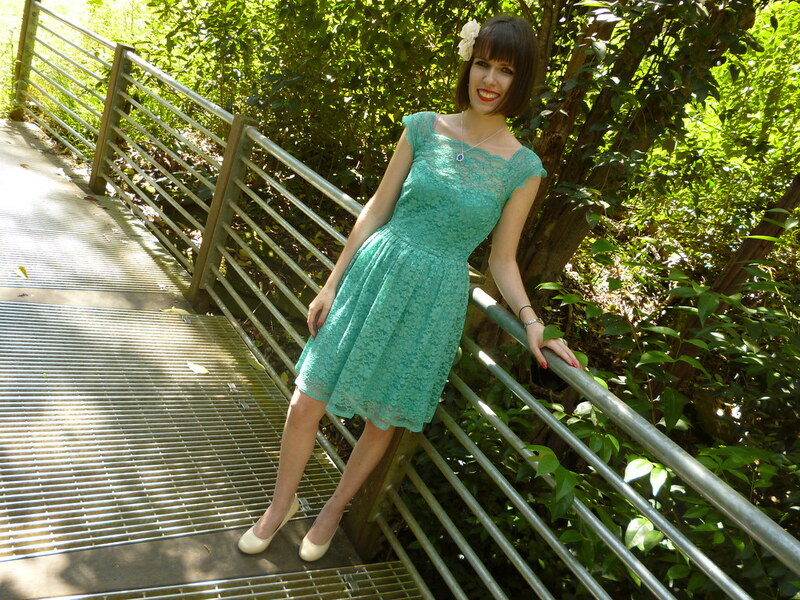 I'm in love with your green lace dress! so lovely dress!you look amazing! Your dress is beautiful! I just love that it's all lace and the color is gorgeous too. I'm loving the red lipstick with it. You look great! This dress looks fabulous on you!! I love the color and the fabric!! that flower is the perfect touch!!! The dress is gorgeous, so feminine and classy! you look so pretty 🙂 I need to learn to pull of red lipstick like you! I love your sense of style because it is so different from what you see everyday. The pretty dresses and the Mary Jane shoes work on you. You always look beautiful! Oh you look so sweet and beautiful! That has to be my favorite dress of yours! you have a really nice blog, would you like us to follow each other? That dress is so pretty, I love the color! That dress is so pretty & romantic – such a sweet outfit! This dress is really fabolous. The color is brilliant. YOu styled it very good with the shoes and red lips. How do you feel about following each other? You look stunning! I love the color and the lace is gorgeous. such a lovely dress! !i am a new fashion blogger from indonesia living in singapore 🙂 i really like your blog. i will really reaaally appreciate & it will be an honor to have u as my blog member. Nice dress,hon!Looks lovely on you! wow. I would definitely pay a pretty penny for that dress too! Its so VINTAGE I absolutely love it. Favorite thing I've seen on your blog! love that it's all lace too. you're so cute! You look gorgeous! I adore that dress. The color is perfect on you!